Labor History: The Great Railroad Strike of 1877: An Instructional Packet for Teachers and Students of Labor History in New York State and the United States of America was produced by The Friends of the New York State Newspaper Project in 2001. Originally developed as a loose-leaf book, the packet is now available online. These materials include seven student activities based on 15 newspaper articles from The Albany Argus (1877) and the Buffalo Morning Express (1892). The activities in the packet correlate with the New York State Learning Standards and Performance Indicators for the Intermediate and Commencement Levels. It is aimed at social studies and language arts teachers of grades 7, 8 and 11. Internet Bibliographies: The Internet Bibliographies are a collection of web links on a variety of subjects that complement strengths in the State Library's collections. In addition to links on Education K-12 and Colleges and Universities, there are also Internet Bibliographies that cover subjects such as African-American resources, biography, grants, genealogy, federal government information, health and medicine, Hispanic and Latino resources, language and literature, Native American resources, New York State government, newspapers and science. For further information call the NOVELNY Help Desk at 877-277-0250 or in the Capital District call (518) 486-6012. Regents Exams: Copies of many of the Regents high school examinations, from August 1961 to the present, are available online as PDF files. New York State Library Digital Collections: In addition to the Regents Exams, many other documents from our collections, particularly publications of NYS agencies and certain historical documents, are also available online in PDF format. See also Teaching about Life in the Hudson-Mohawk Valley: Maps. Through interlibrary loan -- Through your school or public library, you can request books from NYSL, as well as free microfiche copies of ERIC documents. Education Collection: The New York State Library has an extensive collection of education and education-related information, current and historical. Resources include Education Resource Information Center (ERIC) documents, which include items such as curriculum guides, reports, and lesson plans, full text journal articles, college catalogs, financial aid information, and education law. Newspaper Collections: The State Library has a large collection of current and historical newspapers, in print or on microfilm. Our collection is particularly strong in papers from communities within New York State. Newspapers on microfilm may be used onsite or the microfilm may be requested through Interlibrary Loan, which is done through your local library. Manuscripts and Special Collections: The Manuscripts and Special Collections Unit of the New York State Library collects primary source items such as archives and manuscripts, rare books, maps and atlases, prints and photographs, broadsides and posters, musical scores and ephemera. These collections document the history of New York State from the 17th century to the present and illustrate the history of many topics related to American history, literature, science and the arts. 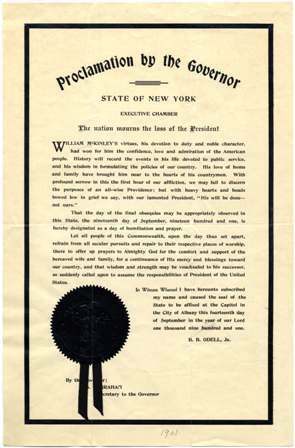 Historical Documents (Online): Since 1995, the New York State Library has been scanning New York State government publications and making them available online. In 2006, the State Library expanded the types of materials being scanned to include various historical documents. These items, which were scanned from paper copies located in the State Library, are freely available as PDF documents on the State Library's web site. List of Civil War materials with links to the digital documents. List of Museum publications with links to the digital documents. This includes publications describing the birds, fauna, flora, and geology of New York State. List of New York State Government materials with links to the digital documents. This includes biographical sketches of former legislators and public papers of some former governors. List of Native American Materials. This includes letters, maps, and purchase agreements. Historical Documents Inventory (HDI): Historical societies and other document repositories throughout New York State also have primary source materials. Although these materials are not held at the State Library, there are records (labeled HDI) for them in our catalog. To access any items labeled HDI, contact the institution mentioned in the LOCATION part of the catalog record. Talking Book and Braille Library: Schools or individual children can enroll in the Talking Book and Braille Library and register to borrow audio books and digital players, as well as books in braille. Schools may contact the Library for a special educator's registration and information packet, which includes an application for school service, student certification forms, School Guidelines, information for parents, sources of textbooks in special format, and a sample braille alphabet card. See TBBL Youth Services for more information. 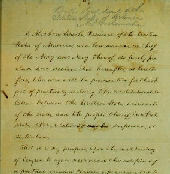 Online Exhibits: The Online Exhibits contain images of the actual items, such as a bronze bust of Washington, Lincoln's hand-written draft of the Preliminary Emancipation Proclamation, or trolley tickets and photographs of trains, all from collections in the New York State Library's Manuscripts and Special Collections Unit. By using the Virtual Exhibits, primary source materials can be easily read online by students in various areas of the State even if they cannot come in to the Library to see the original documents. Need Expert Help? Librarians familiar with education resources are available to answer questions, and provide guidance to library materials. You can contact them in several ways. Find Your Local Public Library: A directory of and links to public libraries throughout New York State. Many of these libraries are listed in the Historical Documents Inventory as owning primary source documents. The Digital Collections: A gateway to materials held by the New York State Archives, Museum and Library. Resources in the New York State Museum: The New York State Museum offers teacher guides, science information, onsite visits, and more. New York State Office of Public Broadcasting: The New York State Office of Public Broadcasting has many resources for teachers including instructional videos, lesson plans, professional development courses, and more.